photo by Mike DuBose.Click on image to enlarge. View more photos. 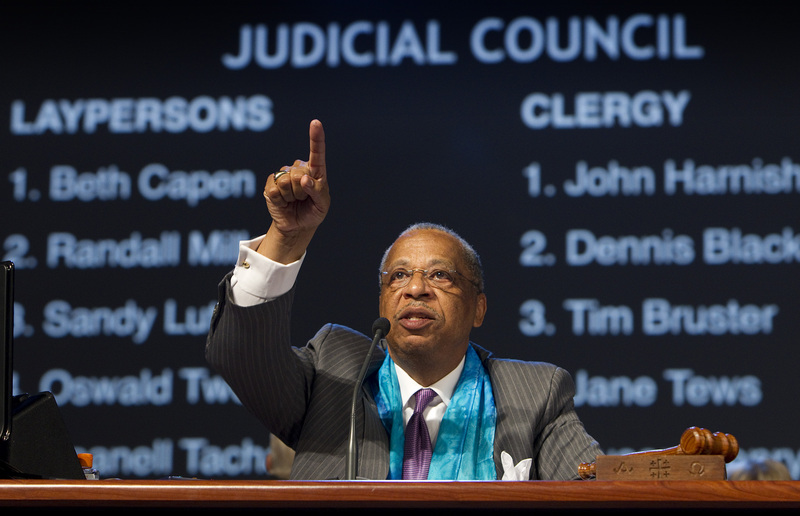 Two Africans were the top vote-getters for open seats on the United Methodist Judicial Council, the denomination’s top court. The United Methodist General Conference conducted elections April 30 for two clergy and two lay positions on the nine-member council. Members are elected for eight-year terms and five of the current council members are still serving those terms. Elected to fill the two open clergy positions were the Rev. J. Kabamba Kiboko of the Southern Congo Annual (regional) Conference in Africa, who was nominated from the floor, and the Rev. Dennis L. Blackwell of the Greater New Jersey Conference, who had just completed a term on the Judicial Council and was re-nominated by the Council of Bishops. The first woman ordained in the Southern Congo Conference, Kiboko recently was elected president of the denomination’s African Clergywomen. She holds advanced degrees from Iliff and Perkins theological seminaries, currently serves as an associate pastor and has been a translator at General Conference since 1992. Blackwell has been pastor of Asbury United Methodist Church in Woodlynne, N.J., for 25 years and is enrolled in the Ph.D. program at Alvernia University. He also has a master’s degree from Asbury Seminary and served on Judicial Council from 2004 to 2012. Elected to fill the council’s two open lay positions were N. Oswald Tweh Sr., of the Liberian Conference in Africa, nominated by the Council of Bishops, and Beth Capen, New York Conference, who was re-nominated by the Council of Bishops after finishing her term on Judicial Council. Tweh holds law degrees from the University of Liberia and Harvard University. He has served as assistant professor at the Louis Arthur Grimes School of Law at the University of Liberia and was president of the Liberian National Bar Association from 2006-2008. Capen, who served numerous times as a New York Conference delegate to General Conference, was first elected to Judicial Council in 2004. A lawyer in private practice, she also has served on general church agencies and commissions and is active at the conference, district and local church levels. The Rev. Susan Henry-Crowe, who has served as the Judicial Council president from 2008-12, was not re-elected but is among the clergy alternates. The Rev. Timothy K. Bruster, Central Texas Conference, was elected the first clergy alternate. Other clergy alternate members elected, in order, were the Rev. John E. Harnish, Detroit; Henry-Crowe, South Carolina; the Rev. Øyvind Helliesen, Norway; the Rev. Jane A. Tews, Desert Southwest; and the Rev. Laura B. Easto, Baltimore-Washington. Elected as the first lay alternative was Sandra W. Lutz, East Ohio Conference. Other lay alternate members elected, in order, were Kurt Glassco, Oklahoma; Randall Miller, California-Nevada; Deanell Reece Tacha, Kansas East; W. Warren Plowden Jr., South Georgia; and Reynaldo de Villa Abdon, Philippines Cavite. The Judicial Council is required to review each decision on a point of law made by a bishop during an annual conference session. Other cases come from lower church courts or from an official body of the church requesting a declaratory decision as to the legality of a particular action. There usually are several requests during General Conference for declaratory decisions.